Every Tuesday I volunteer at Petsmart. 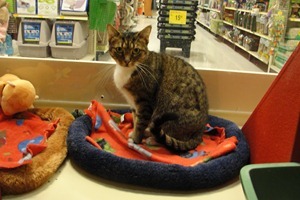 I take care of and play with cats that need homes. Right now there are 5 cats named Liz, Freeway, Muffin, Missy, and Princess Diana. Muffin and Missy are Sisters but muffin has a lot of white on her chest and is laid back but doesn’t like to be held very much. 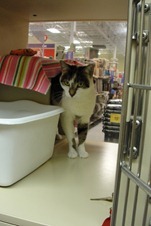 Missy has no white fur and is very shy but curious about just about everything! She and I have created a bond and the second day I saw her, it was like we have known each other since she was a kitten. Missy also likes to lick your fingers and bite on your fingers very softly like she is sucking on you finger. Freeway is a beautiful cat that has a light brown stripe on his chest to his belly, which makes him one of my favorite cats there for some reason. If he was my cat, I would name him cookie because I am always calling him that and he reminds me of a cookie. It is always funny because he likes the big cage (where two other cats stay) and when it is time to go and put the cats in there own cages, he clings to the big cage door for dear life! Liz and Princess Diana have been there for a while like Muffin and Missy but longer! Princess Diana and Liz are both pretty young and are very lovable. 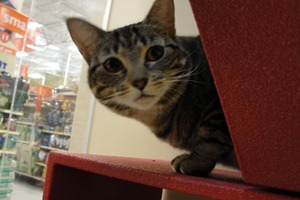 Princess Diana loves to run around the small room and is always ready to play. There is a difference between putting Princess Diana in and out of the cage. When she is in her cage, she is calm and likes to be petted. But when Princess is out of her cage, there is no stopping her playfulness and energy. Liz is good with Muffin and Missy. They can all be in the same room and not mind. 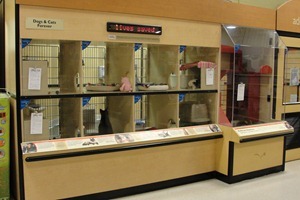 So every Tuesday is a new day at Petsmart to see if any cats are adopted or not. Even though they are not horses, I love them all so very much. This entry was posted on Monday, March 22nd, 2010 at 11:22 am and is filed under Florida. You can feed this entry. Both comments and pings are currently closed.